Asha is a dragon-slayer. Reviled by the very people she’s sworn to protect, she kills to atone for the wicked deed she committed as a child – one that almost destroyed her city, and left her with a terrible scar. But protecting her father’s kingdom is a lonely destiny: no matter how many dragons she kills, her people still think she’s wicked. So to unite the fractured kingdom, she must marry Jarek, her father’s cruel commandant. As the wedding day approaches, Asha longs for freedom. Just when it seems her fate is sealed, the king offers her a way out: her freedom in exchange for the head of the most powerful dragon in Firgaard. And the only person standing in her way is a defiant slave boy . . . 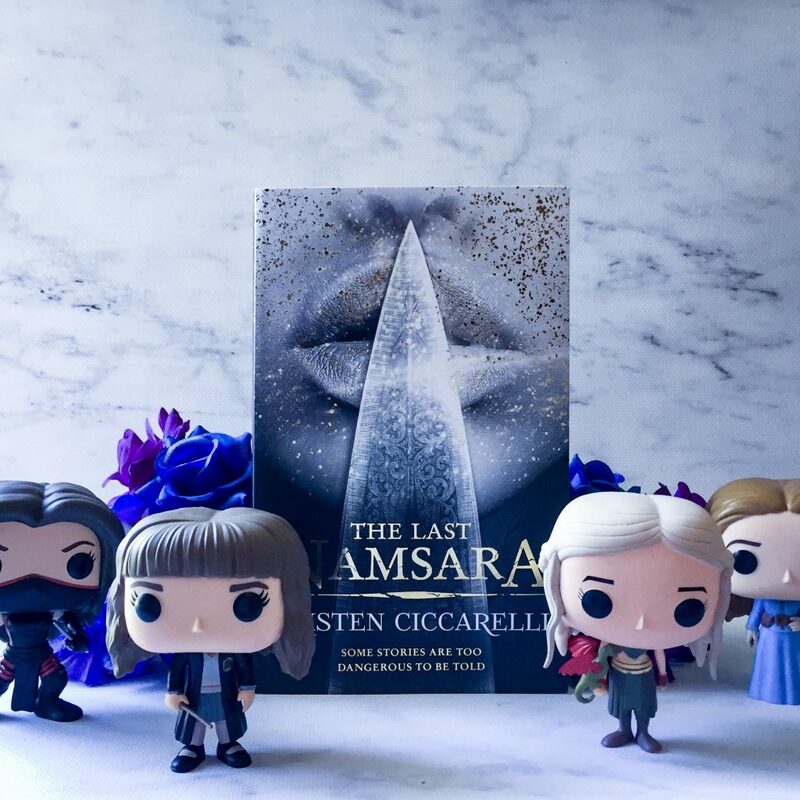 The Last Namsara by Kristen Ciccarelli is the first book in a fantastic new high fantasy series. It’s adventurous, gripping and fun, with fantastic characters that you grow to love, and a really unique premise that I marvelled at. Asha is a princess but has grown up being feared and despised. When she was a child, she rebelled and told one of the ancient ‘stories’. As a result, the First Dragon Kozu fought her off and burned her and half the city. She brought upon the death of many people in her kingdom, and the scar on her body is a daily reminder of her foolishness. To compensate, she’s the fiercest, most deadly dragon slayer in the land and after every conquer she brings home the head of the dragon to her father, the King. Asha really grows over the course of the novel. Initially, she’s rude, arrogant and spoilt. But she’s also intelligent, strong and capable. She becomes a driving force in the book and a really strong protagonist. She is also drawn to the stories of the past, sometimes using them to lure in dragons before she kills them. But those stories are what killed her mother, and she knows that just using them is a crime. The Last Namsara is rich with Figaard mythology and ancient legends and stories, with pretty much every second chapter being a story from centuries ago. It all flows really well, and I found myself just as intrigued by the history of the book as I was in the present storyline. I adored this book, reading it in one day. The Last Namsara portrays courage, loyalty and the importance of family and love — there are multiple layers to this novel, and the more you read of it, the more you come to love these characters and this world. Additionally, The Last Namsara is a coming of age novel. Asha, once feared and despised, fulfils her purpose in this novel as Iskari — a ceremonial warrior named for a ‘deadly’ God. And later in the novel, Asha becomes something much more. She becomes the key to settling all unease in the kingdom, and along with her brother Dax and the slave boy Torwin, they are able to work towards correcting all injustices. I did find the relationship between Asha and slave boy Torwin to be slightly odd and unlikeable. Their ‘love’ for each other seems to develop rather quickly, and doesn’t seem to be relatable or believable. For the majority of the novel, Asha only refers to him as a slave, even though she knows his name. Asha comes across as quite disrespectful at times, and even though that illustrates how far she outranks him, it’s a little jolting for the reader and it’s hard for us to really cheer for them as a couple when she treats him so terribly. Their relationship is so unbalanced that it’s hard to really push past their character dynamics and their exchanges. “He’ll go to the pit tomorrow and never come out,” Dax said. As if a slave dying in the pit was supposed to elicit her sympathy. Slaves died in the pit all the time. The Last Namsara is rich with storytelling and history, beautifully written and expertly illustrated. Despite some flaws — particularly with Torwin’s character — I did really love this book and I’m desperate to read the sequel next year.